New York Roads - I-/NY 878 NY 878 (I-878), Nassau Expwy. NY 878 is the little freeway that couldn't. (It can't even own up to the fact that it's actually I-878 - you won't see a single Interstate shield.) Its history begins long ago at the Holland Tunnel, where I-78 was meant to continue across Lower Manhattan to the Williamsburg Bridge. It would have followed the cancelled Bushwick Expressway to Atlantic Boulevard, where as you can see on the NY 27 page (linked below) there is a very wide median that would easily accommodate an Interstate. I-78 would then have become the Nassau Expressway, continuing eastward to the Clearview Expressway, now I-295. The Clearview currently ends at a stub to the north, but I-78 would have followed it over the Throgs Neck, over what is now I-695, to end at I-95. The Nassau Expressway would have continued on as I-878, southeast around JFK Airport, to cross the Atlantic Beach Bridge (as the Nassau Expressway currently does). It then would have turned east as a beach freeway to an eventual end. I-78 was cancelled, but I-878 lived on for awhile. The Nassau Expressway was constructed just south of the Belt Parkway as a three-mile freeway - eastbound. Westbound was a much shorter segment, meaning there were about 2 miles of EB-only Interstate. Then, the concept of extending I-878 died, and possibly the Interstate designation as well. Rockaway Boulevard, which is six lanes divided, easily handles the traffic east of the end of the Nassau Expressway freeway, but just to be sure, a piece of surface Nassau Expressway was constructed just east of Far Rockaway. All things Nassau Expressway were signed NY 878, meaning that there are a couple of miles between NY 878 of unnumbered Rockaway Boulevard. The beach freeway was cancelled entirely. The end of this intrigue is that the FHWA, which didn't recognize I-695 until April 2008 (more than 40 years after it opened, but it wasn't always "I-695"), does however recognize I-878, though NYSDOT doesn't sign it as an Interstate anywhere. Based on the mileage listed by the FHWA, it's possible that only the one-way Nassau Expressway is an Interstate - not even the two-way. The first gantry on NY 878 EB once it breaks away from NY 27 does have button copy, which I present at full-size in the second photo. 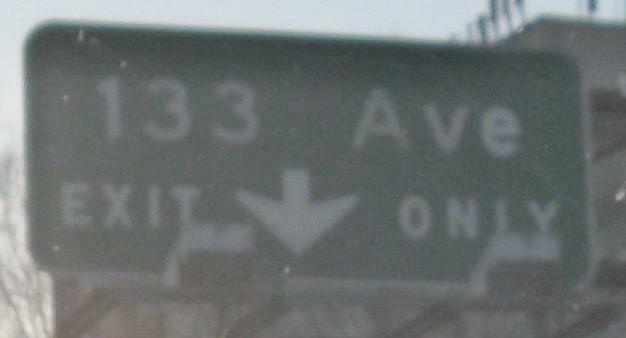 It also has newer squished signs, as if the NY 878 and airport shields came as a total shock to the signmaker. 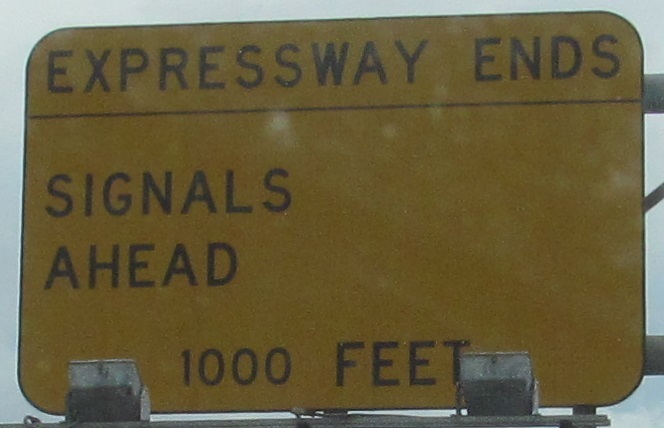 If so, why was "Nassau Expwy" shifted to the right? My bet is that there was an I-878 shield under there that the contractor was forced to cover up, a decision I disagree with. The surprise I got in revisiting this route is that even NYSDOT considers it an Interstate, based on the reference markers. That's misleading, though, because reference markers (look at the top line, where it says 878I) often are not updated when a route number changes. So new ones will still say 878I because they're replacing old ones that already do. 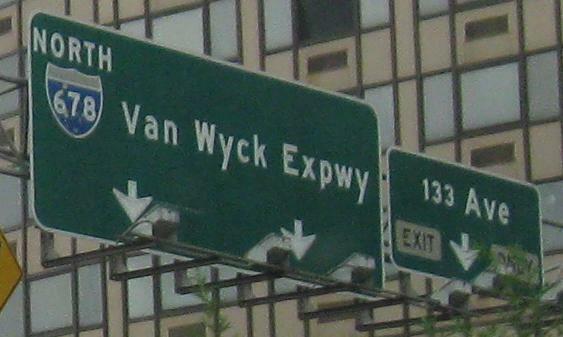 More button copy and another opportunity to enter the airport before the FHWA Interstate (original I-878 as signed by New York), the freeway, and the western section of current NY 878 end. The thing to note about the second photo is that while there's no button copy, the left sign is laid out as if several messages were patched onto it over several years, which is not the case. Also, the exit numbers were added after the signs - see the Exit 1 signs above, where both button copy and reflective signs have the same style of exit tab. The green is a little darker. Fitting with the misalignment of the left sign in the second photo, its exit tab is also misaligned - the word EXIT is bottom-justified instead of center-justified. Shifting the rant to the third photo, there should be a diamond signal warning sign up there, but the sign appears to never have gotten one. It also needs a border with better spacing to the text. Nassau Expressway WB, as short as it is, WB where the EB side breaks away, and then up what would have been the Exit 2 ramp but is now the mainline. There is no evidence of clearing for the WB lanes, just empty right-of-way. The WB road then splits; the left split either merges onto the Belt Parkway or has access to NY 27 WB (N. Conduit Ave.), and the right split gets the signs you see in the last two photos.